Doug Watkins, bass; Elvin Jones, drums. Recorded on April 15, 1958. Riverside brought its equipment to the Five Spot Cafe during Pepper Adams' engagement there to sample a full evening's action: from, as the title notes, 10pm to 4am. 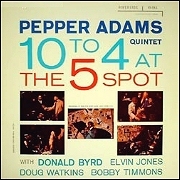 Since jazz can be so much a product of its surroundings, it should be pointed out that the Five Spot, which first became an important factor on the New York scene in 1957, has quickly gained a reputation among musicians as a club significantly lacking in tension or formality, an unusually good, relaxed place to play in. The atmosphere of the club and the talents of the Adams quintet seemed to us a most exciting combination. Donald Byrd, Elvin Jones and Doug Watkins are all fellow Detroiters, whom Adams first came to appreciate at local sessions. 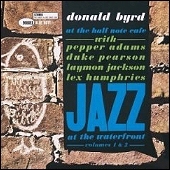 Byrd has been most highly regarded and in demand ever since he first hit New York; his constantly improving tone, technique and imagination indicate that he will continue that way. Jones, a brother of pianist Hank and trumpeter Thad, has worked with J.J. Johnson and Sonny Rollins; he is a drummer of striking inventiveness and much fire, qualities that are particularly in evidence here on Byrd's jazz march, "The Long Two/Four." Watkins is a firm young bassist who has worked and recorded extensively with top Eastern groups; Bobby Timmons, the quintet's only non-Detroit member, is a promising young pianist whose credits include service with Art Blakey's Jazz Messengers. The selections here, as culled from the full night's work, immediately reflect one distinctive facet of "live" recording: the natural tendency to stretch out freely and at greater length than in the studio. Actually, Pepper noted, "we were holding down a bit; sometimes, when we really get going, one tune can last for a half hour, but I didn't think you'd want that." 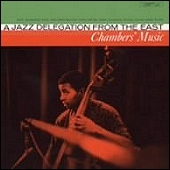 Included are the group's theme "'Tis," [mp3] written by Elvin Jones' brother Thad; a standard ballad ("You're My Thrill") spotlighting Pepper in a lyrical vein; two examples of Byrd's fine composing talents: the sensitive "Yourna" and the swinging 2/4 march; and a rousing blues, "Hastings Street Bounce," adapted by Pepper from a number of remembered from an old recording.